Endeavour’s flight crew have completed the mission’s first EVA, focusing on MISSE experiment swap outs and ammonia jumper line installations. Meanwhile, engineers on the ground poured over imagery data from FD-3’s RPM (R-bar Pitch Maneuver) which helped engineers identify a debris impact area on Endeavour which will require a Focused Inspection (FI) during FD-6 (Saturday). After waking up at 2226 EDT, Endeavour’s crew got right to work preparing for the mission’s first of four spacewalks. Upon repressurizing the Quest Airlock (where Drew Feustel and Greg Chamitoff spent the night) from its overnight 10.2 psi campout pressure, the spacewalking duo enjoyed a brief hygiene break before re-entering the airlock which was promptly depressurized back to 10.2 psi. Spacesuit purge was then conducted about two hours after the completion of this hygiene break, and spacesuit pre-breathe commenced shortly after the spacesuit purge was complete. Following ISS crew wake up, depressurization of the crew lock got underway. Once the crew lock was depressed, the outer hatch was opened and Feustel and Chamitoff took their spacesuits to battery power – officially beginning the EVA. After exiting the ISS, Feustel and Chamitoff spent about 20mins setting up their various tools. Then, Feustel translated to the MISSE (Materials on ISS Experiment) 7 experiment and removed it from its current location on the Space Station and replace it with the MISSE 8 experiment. During this time, Chamitoff translated over to the P3 truss where he worked on installing a light onto the CETA cart. After this, Chamitoff translated across the ISS’s Integrated Truss Structure to the Starboard SARJ (Solar Alpha Rotary Joint), where he installed a cover in the SARJ cover 7 position. Meanwhile, at the tail-end of Chamitoff’s work on the SARJ, Feustel translated over to the P3/P4 truss and began work on ammonia jumper line installation. Feustel then move on to install another ammonia jumper across the P5/P6 truss while Chamitoff stowed the P4 ammonia jumper. Feustel next moved on to install the P6 EAS jumper before the spacewalking team tackled the Lab EWC antenna operation. However, due to a problem with Chamitoff’s CO2 sensor, 45 minutes-worth of the task has been moved to EVA-3’s timeline. 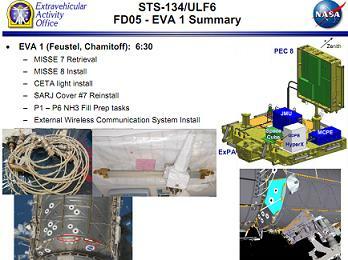 Feustel and Chamitoff split up and worked on mating various P3/P4 and P1/P2 connections for the duration of the EVA, which was the last task of the EVA. EVA cleanup activities followed for Chamitoff, Quick Disconnect tool bag reconfiguration tasks for Feustel. After a total EVA time of 6 hours 19 minutes, Feustel and Chamitoff re-entered the Quest’s crew lock and repressurized the airlock itself. The crew will then spend the remainder of the day conducting post-EVA servicing operations before heading to bed at 1326 EDT. Endeavour continues to perform extremely well during what is her final scheduled mission for NASA. Mated with the International Space Station (ISS), the youngest orbiter in the fleet continues to draw power from the Station-to-Shuttle Power Transfer System (SSPTS) without issue, allowing for her cryo margins to provide excellent mission length ability. “Subsystem performance is nominal. 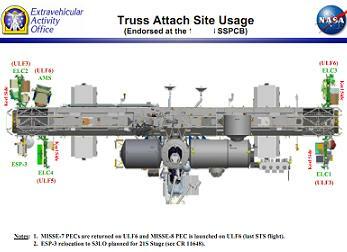 The PRSD (Power Reactant Storage and Distributation) O2/H2 manifold 2 isolation valves were cycled closed for crew sleep at 138:17:51 GMT and reopened at 139:03:55 GMT,” noted the latest status (L2) via the Mission Evaluation Room (MER). “Oxygen tank 4 pressure continues to increase due to nominal heat leak; the pressure in now at 800 psia. Fuel cell 1 H2 flowmeter continues to read high and erratic (not unusual). The fuel cells continue to operate nominally at low power levels in combination with the SSPTS. However, despite the prospect of both a Focused Inspection and a Soyuz Flyabout being included in an already packed mission, the Mission Management Team (MMT) have no plans to extend the mission past the current 16+0+2 duration at this time, mainly in the thanks to the excellent work by the planning team on the ground, according to MMT chair LeRoy Cain. While it has to be emphasized there is no risk to the vehicle or her crew, teams evaluated the potential need for a Focused Inspection on Endeavour’s Thermal Protection System (TPS). Seven areas were flagged via FD3 RPM imagery, requiring the Damage Assessment Team (DAT) to carry out their methodical analysis to evaluate the option of carrying out a Focused Inspection. They immediately cleared four areas, ahead of a ding on Endeavour’s starboard Main Landing Gear Door (MLGD) also being cleared from any further inspections. Two areas remained open from an assessment standpoint going into Friday, with one – on the inboard elevon – then cleared during Flight Day 5. The evaluations have been officially tagged as “MER-7 Tile Anomalies”. “Summary: Imagery review complete. ET (External Tank) doors verified closed. Forward viewing angle and lighting sufficient. Five items on lower surface have been evaluated – All analysis completed. 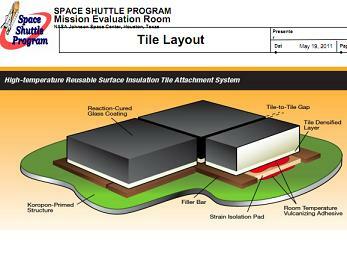 All lower surface tile damages,” noted a DAT overview to the MMT (numerous STS-134 DAT presentations available on L2). “Seven damages identified. Five of the items have been cleared. Two remaining items in work. No downstream effects. “No protrusions or upper surface discrepancies identified. No TPS damage identified at T-0 umbilicals. 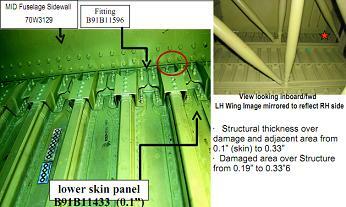 “Focused Inspection Candidates: Inboard elevon tile damage. Damage depth from 3D measurement: 0.3 +/- 0.1”. Thermal analysis in work; Stress assessment to follow. As explained by Mr Cain via one of his excellent overviews on the vehicle’s status, the DAT engineers expect to clear the inboard elevon damage from the need for a FI, but are less confident on being able to avoid a FI on the remaining area of interest, which is located between the starboard MLG and ET door. Clearing all areas with a FI remains a possibility. Although the ding’s appearance is – as explained by Commander Mark Kelly during on orbit interviews – by no means any worse than previously cleared damage, the photography of the area is slightly inconclusive, which may provide the main reason why a FI is still on the cards. “RPM Imagery: Visual indications of RTV (filler bar) and dark line (abrupt change in depth). Three Dimensional data: Indications of ‘ledges/drop off’ in cavity. Decreasing thickness as you approach the edge,” added the DAT summary overview to the MMT. “Three Dimensional Measurements: Maximum depth of damage is 0.6” +/- 0.1”. Reduced confidence as you approach tile edge. “Historical Three Dimensional Accuracy: Good correlation between on orbit and post flight measurements. Confined to shallower damages (0.4” deep or less). 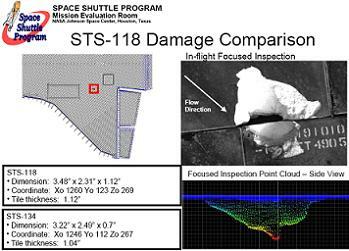 Lone case of deep damage was STS-118. Poor prediction of deep portion (abrupt drop off). Predicted 0.5” VS FI depth of around 1.0” (partially due to shadowing). 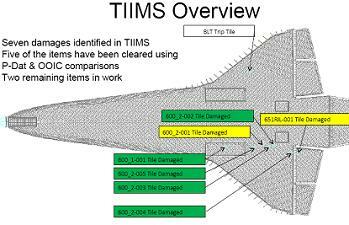 Work being conducted by the DAT engineers includes the utilization of their many analytical tools, along with their understanding of the underlying structure which the damage tile is designed to protect, and the use of flight history. “Cavity definition: Utilize limited point cloud data from imagery lab to generate cavity. Create ‘shoe box’ cavity for use in thermal analysis. Two cavities (3-D and bounding 3-D),” was listed as forward work by the DAT on this specific area. “Aeroheating: Run CFD (Computational Fluid Dynamics) and engineering model to define cavity heating factors. Thermal analysis: Conservative cavity analysis (damage down to dense layer and exposed filler bar). *UPDATE: DAT recommend Focused Inspection on remaining area of interest. “Damage Assessment Team split over value of determining crack tile in damage site. Portion of team recommending Focused Inspection regardless of thermal results. DAT recommends execution of Focused Inspection,” noted Flight Day 5 MMT documentation (L2). MMT concured with this finding. Flight history always plays a major role in TPS assessments, with STS-134’s ding no stranger to Endeavour from both a location, cause and appearance standpoint. 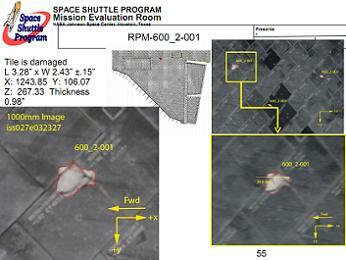 Only inches away from her STS-118 incident in 2007, the tile damage from that mission required a Focused Inspection, prior to being cleared for re-entry – a decision which was shown to be 100 percent correct, with hardly any ill effects observed on either the damaged tile or the underlying structure after examinations on the ground. As was the case with STS-118, Mr Cain also explained that the damage is unlikely to have been related to a foam liberation event, with footage from the Solid Rocket Booster (SRB) cameras now showing what appears to be an ice liberation from an ironically named Ice Frost Ramp (IFR). Two events around T+70 seconds have been observed on the footage, one of which is highly likely to have caused the damage on Endeavour’s belly. With a Focused Inspection confirmed, documentation (L2) had already been drawn up on the procedures for both the Inboard Elevon damage and the aforementioned primary damage site inspections via the Orbiter Boom Sensor System (OBSS). This will now be implemented. New article for FD6 later tonight/Morning GMT.